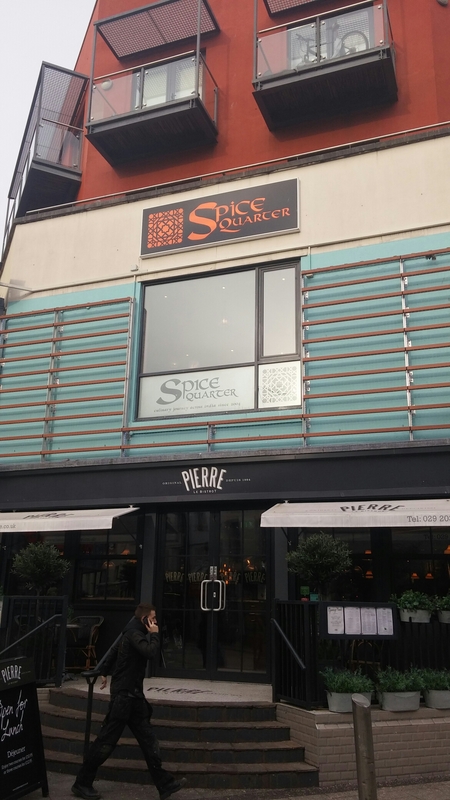 Of these three, a chance look at the Spice Quarter’s website alerted me to the fact that they offered two fixed price lunch menus. 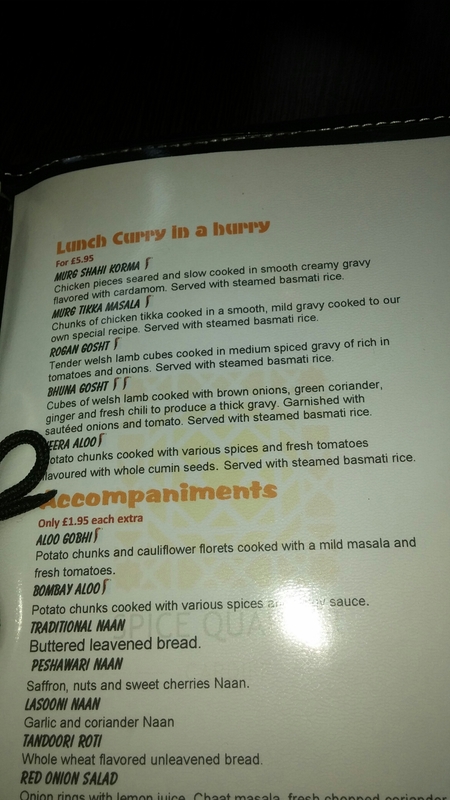 A two course one for £8.95 and a one course “curry in a hurry” one for £5.95. 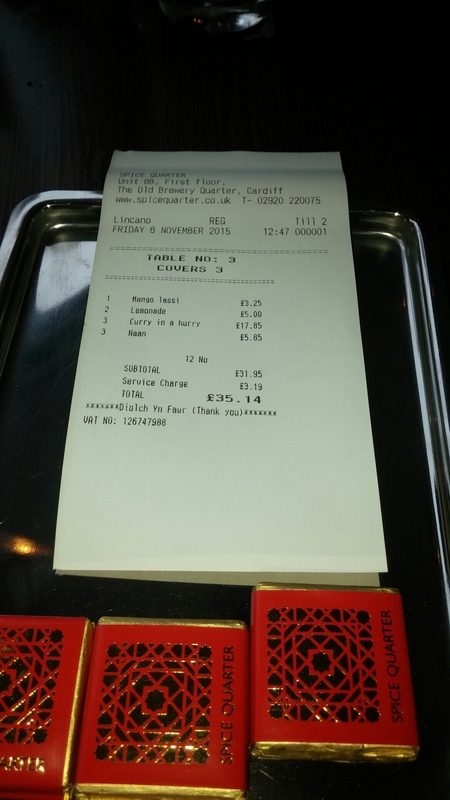 As regular readers will know, I love a good value fixed price lunch menu. A lads lunch (a curry, what could be better) presented the ideal opportunity to check out one of these seemingly rather good lunchtime deals. It is seriously easy to miss this place. 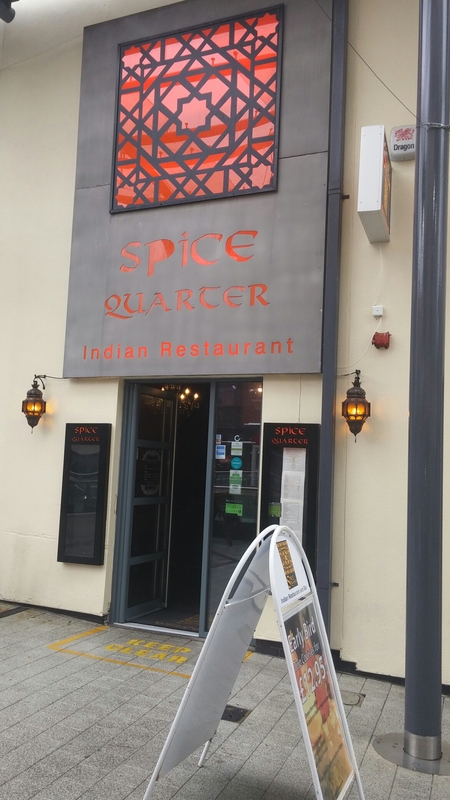 It is above another restaurant and the entrance is not apparent at first sight, being tucked away within the Brewery Quarter itself. It has been around for years, but if I am honest I had forgotten it was still there. 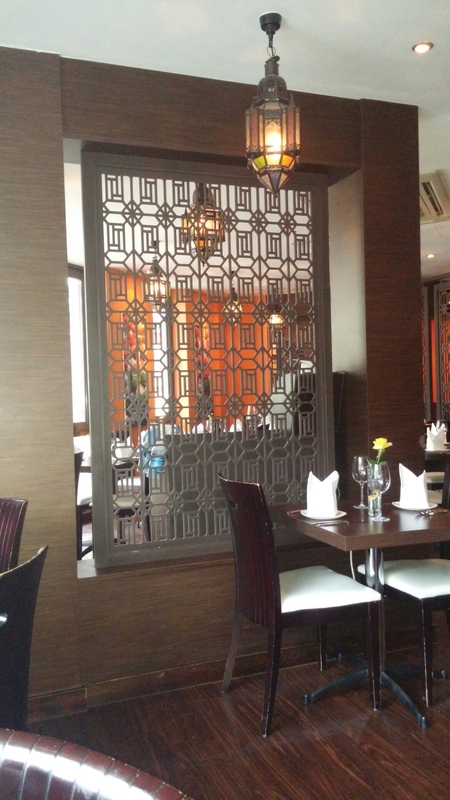 The entrance is somewhat understated and not that welcoming with stair up to a very unappealing fire door entrance to the actual restaurant area. All a bit off putting I thought. I can see people turning tail at this point, but we persevered and once through the ghastly fire door it is an altogether nicer affair. Inside it is a big old unit, but smaller areas have been created though use of screening (nice wooden ones). The effect is still an overall airy space, but a level of intimacy in each area is maintained. I though it quite nice. We went at 12.30 on a Friday lunch time and it was totally deserted. We had to go in search of a member of staff to seat us. Again this would put many people off in my view. Once seated, we asked for the lunch time menu (on their website but not apparent from the signage outside). We were initially brought the evening early bird menu (£12.95 for 2 course). did we get the menus for these. I assume this was just a mix up (I certainly hope so). which came with pilau rice and a salad garnish. The lamb was very tender, but the gravy it came in (whilst ok) was lacking somewhat in spice. I got coriander, but not much of the advertised ginger or chilli. The nicely caramelised onions, however, brought a welcome touch of sweetness to the dish. 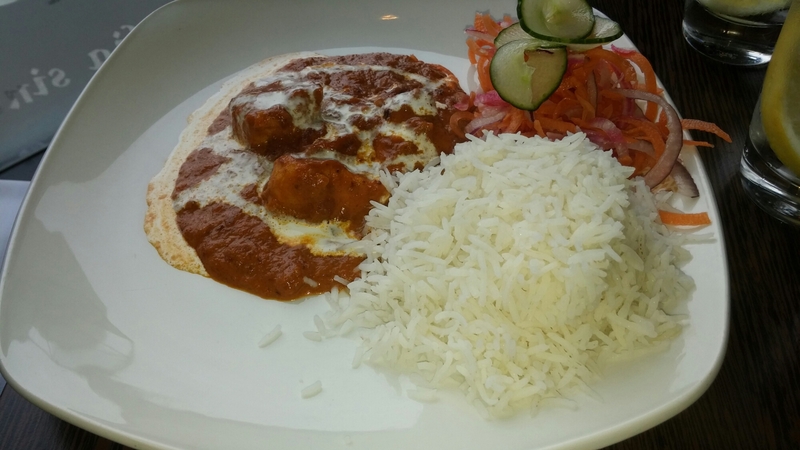 Other dishes ordered were a rogan ghost and a murgh tikka masala. 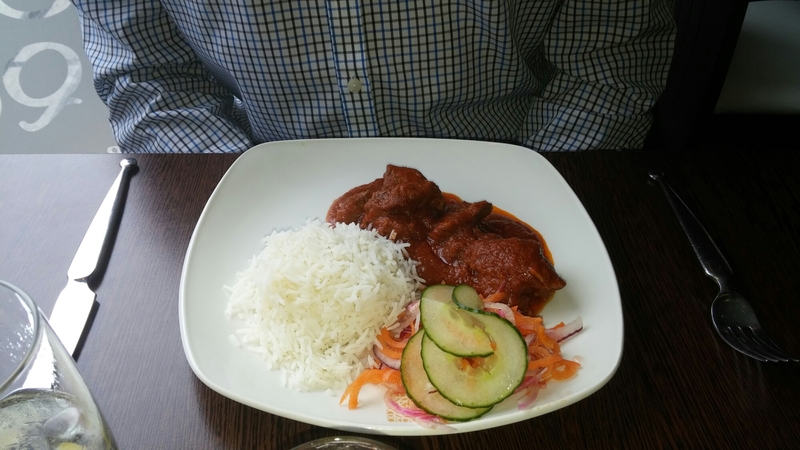 The last dish ordered, in the form of a murgh tikka masala, was pronounced as perfectly pleasant if a tad bland. Presentation needs work here as the cream (yoghurt?) dribbled over the top didn’t look nice at all. 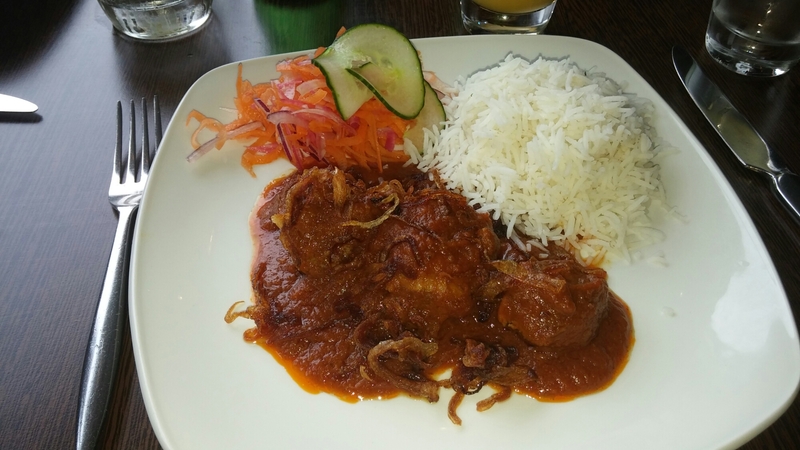 The basmati rice with each dish was nicely fluffy and properly seasoned. The side/garnish salad was ok, if superfluous to requirements in my view. Ditch it and add more rice or curry is my advice. 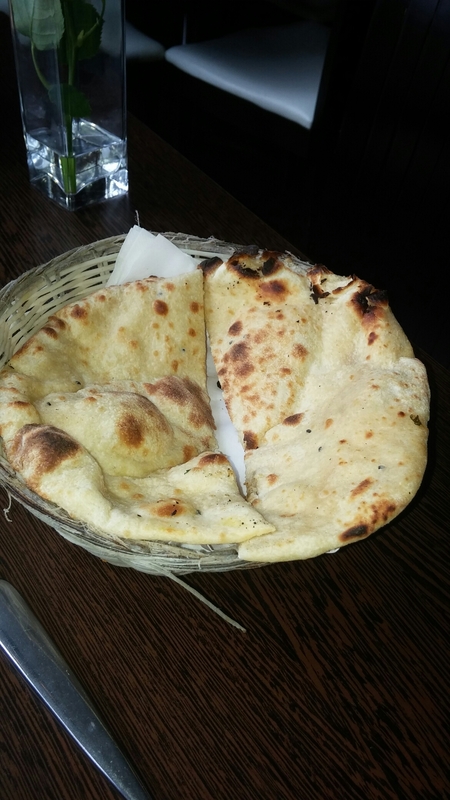 We all ordered a plan naan (£1.95). These had a reasonable crispy exterior and a not too doughy interior. Size wise, whilst not a large portion, each dish was perfectly fine for a mid week lunch. 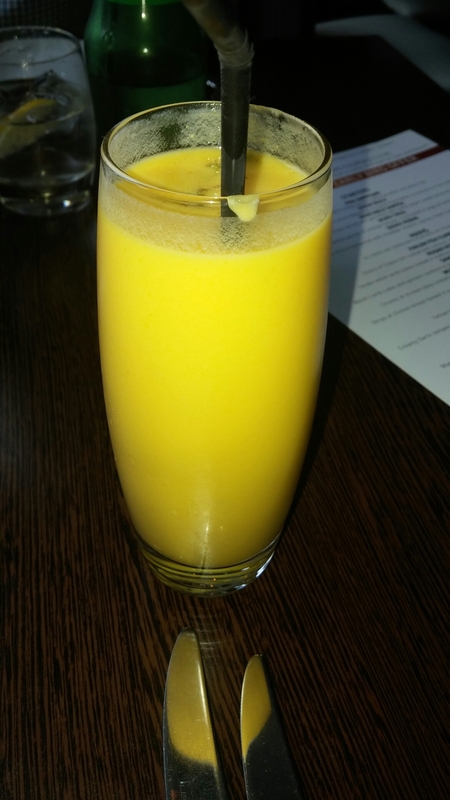 I went for a lassi in the form of a very pleasant (if a tad pricey at £ 3.25) mango one. The booze menu has the usual suspects beer wise and a strangely large cocktail menu. Personally I wouldn’t drink cocktails with curry. On the wine front it is predominately New World with a couple of Indian wines from Soul Tree. The latter are around the £18- £19 mark making them pricey, compare to say Chai Street in Cardiff (when I last went to Chai Street bottles of Soul Tree were £11.50). Not the most welcoming of places, I have to say. They really need to do a bit more to attract the lunch time punters. If not, why bother opening in the day? Food wise it was OK without setting the taste buds alight and the price of £5.95 for a dollop of curry and rice ain’t bad at all. With drinks and naans (and an automatically added service charge -which I hate) the £5.95 one course offer came out at a slightly less impressive £35.14. for three of us (so about £12 per head). Ok but not amazing value. Will I go back? Not sure. Was alright, but nothing more and eating in a deserted place is always a bit disconcerting. To counter that despressing feeling when you are the only diners, the food needs to be great or a massive bargin. It was neither, being OK and cheapish. The fact that it was empty perhaps says it all. Shame really as it is a good concept a £5.95 lunch time curry. For a cheap lunch Gina’s cafe offers better value – especially if you go for the dosas – to my mind. Sun: 5:00 pm – 10pm. 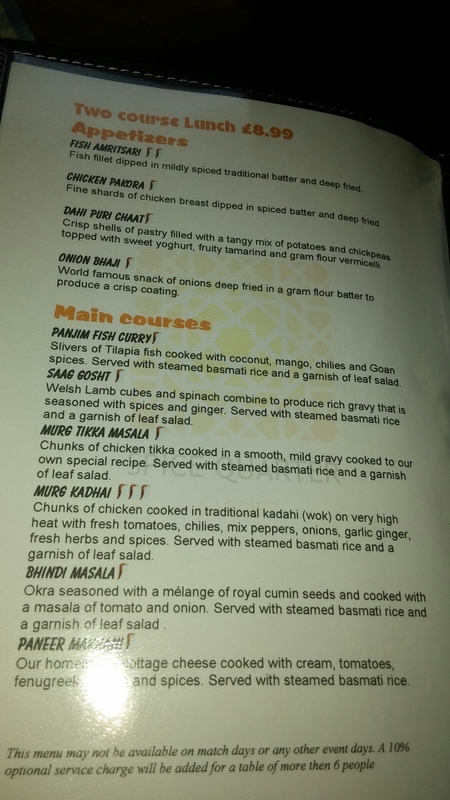 This entry was posted on Dec 6, 2015 by solicitingflavours in Alcoholic drink, Cardiff, Cardiff restaurant, Curry, Drink, early bird menu, Fixed Price Menu, Food, Food and wine products, Indian, Indian wine, lunch, lunchtime, Non alcoholic drink, Restaurant Review, review, Spice Quarter, Wales.